That finding is particularly impactful since Bartonellosis is sometimes treated differently than other vector-borne diseases. 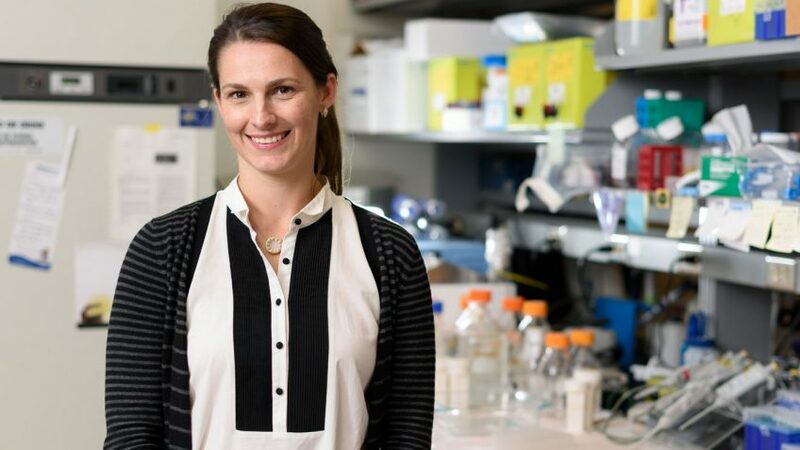 Earlier this month, Lashnits was one of just 10 veterinary medicine residents nationwide to receive the American College of Veterinary Internal Medicine’s Resident Research Award for her work on Bartonella. The research was co-authored by Barbara Hegarty, supervisor of the CVM’s Vector Borne Disease Diagnostics Lab, internal medicine professor Adam Birkenheuer and epidemiology and public health professor Maria Correa. Lashnits’ mentor and Ph.D. adviser is Ed Breitschwerdt, professor of medicine and infectious disease, who has spent more than three decades studying vector-transmitted pathogens. A New York native, Lashnits holds a bachelor’s degree in astrobiology and a master’s in biology, both from Stanford University. She conducted research on chronic inflammation at the University of California, San Francisco, before earning her DVM from Cornell University. She worked in general practice for a few years in Buffalo, N.Y., before coming to the CVM in 2015. Lashnits is in CVM’s rigorous Clinician Investigator program, which combines a small animal internal medicine residency with a Ph.D. in comparative biomedical sciences. Lashnits is finishing the second year of her residency and the first year of her Ph.D. work on Bartonella epidemiology. Breitschwerdt described the team’s research as the largest Bartonella epidemiological database reported in veterinary literature to date. 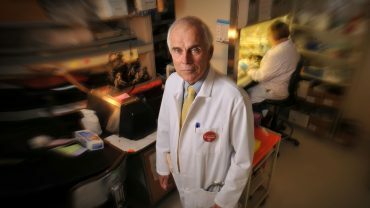 Widely recognized as a world leader in Bartonella research, Breitschwerdt directs the Intracellular Pathogens Research Laboratory at NC State’s Comparative Medicine Institute. That lab isolated, genetically characterized and named the first Bartonella species ever found in a dog anywhere in the world, said Breitschwerdt. The CVM’s Vector Borne Diseases Diagnostic Laboratory, which Breitschwerdt co-directs, validated tests detecting antibodies to the pathogens in dogs, other animal species and humans. In dogs, Bartonella is associated with heart valve infections and several chronic illnesses. An expanding list of Bartonella species and subspecies infect humans. One Bartonella species leads to cat scratch fever in people. Another transmits trench fever. Several can cause inflammation of the inner layer of the heart. “Hopefully we will have some more information out on Bartonella risk specifically in North Carolina in the next year,” said Lashnits. There is evidence that various Bartonella forms have evolved with their hosts around the world. Bartonella subspecies have successfully co-evolved with cats, dogs, cattle, sheep, squirrels and kangaroos. The project is a milestone in the growing field of Bartonella research. According to Breitschwerdt, before 1990 there was only one named Bartonella species. Now there are 36, with 17 of those connected to a spectrum of diseases. In a paper published this year, Breitschwerdt wrote that Bartonella and Bartonellosis, “represent one of the more important contemporary One Health challenges of modern times.” The One Health approach to medicine, to which the CVM subscribes, links the health of people to the health of animals and the environment. As Lashnits’ work helps fill the gaps of knowledge about Bartonella, there are still more questions. There’s also an unwavering commitment to answer them.